You can get all the core RPG and expansion from Eon Legacy here! Set hundreds of years in the future, where magic is real, monsters walk the streets, the wilds of the world had been restored, galactic travel is common and high-tech aliens vie for wealth and glory across the infinite realms in unending multitudes of alternative universes, and fractures of reality. Eon Legacy, takes an action-adventure RPG approach from it’s own rich original lore and with it’s great wealth of expanding content will keep the story going forever. Multiple Different Included Optional Mechanics for players of all ages and and skill levels may partake. Over a Dozen of Original Player Races and Tools for Player Created Character Races (Bring whatever from wherever as long as the Storyteller says “yes”). Original Classes for all different styles of play from Sword Wielding Martial Artists to Magic Gauntlet Brandishing Space Paladins and Power Armor Clad Gunslinger Space-Cats. Tools for World Crafting, NPC Crafting, and already established Lore for Storytellers to use. Rich Original Characters and Lore to populate your universe and use as samples for far greater expansive stories. Tons of planned expansion and content supported and updated at TheDragonmoon.com! Buy Now AT LULU and click this Link! 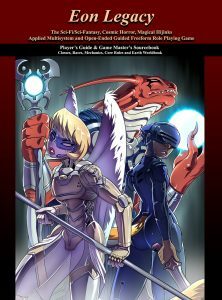 THIS BOOK CONTAINS DOZENS OF OFFICIAL RACES TO EXPAND YOUR INFINITY! 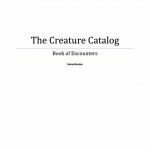 This book was made with dozens of new creatures to add to your universe, multiverse, infinity and beyond! It also includes the Omnitemplate which will let you expand vastly upon creatures, NPCS, and even more Player Character Races!